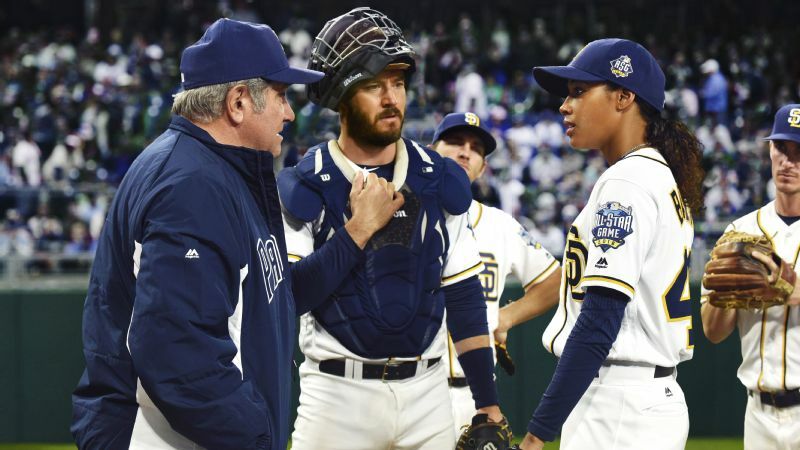 Major League Baseball playoffs are in full swing (Go, Astros) and, there are not nearly enough shows about baseball, or that even include characters that at least play baseball. Here is my list of players, and really just anyone baseball adjacent (coaches, announcers, etc.). I did not include episodes in which regular characters play a random game of baseball, but I did include guest stars who only appeared in one episode of their particular show. Sam was a relief pitcher for the Boston Red Sox, but had to retire early due to his alcoholism. Sam now owns a Boston bar. This is still one of my favorite shows of all time. Eddie is a baseball slugger who suddenly cannot hit, and seeks help from psychotherapist Dr. Dani Santino. The show usually centered around football, but I always enjoyed when they explored other sports. Ginny is a pitcher, and the first female player in Major League Baseball. She is a starting pitcher for the San Diego Padres. I am still not over the cancellation of this awesome show. Carrie catches a fly ball at a New York Yankees game, and uses her press pass to score a date with the new Yankee. They go on a few dates but, she ultimately breaks up with Yankee Joe. Considering the show was set in NYC, which is a big sports town, I am actually surprised that the girls did not date any other professional athletes. Dolores: There’s a path for everyone. Your path leads you back to me. Peter: You don’t know where you are. Do you? You’re in a prison of your own sins. Bram: Hey, pal, if you want to do a little do-si-do with Gloria, the gal I walked in here with, she’s got quite a beaver. Bram: Her coat is beaver. Cleo: Nothing radical has ever been catered. Luke: I’m about sick of always having to buy new clothes. Josh: What do you say about a government that goes out of its way to protect even citizens that try to destroy it? Lucifer: Liar, liar, slutty dress on fire, Mother. Lucifer: How far can a celestial being trapped in a feeble human body for the first time get? Maze: Well, let’s see. She’s stupid hot, wearing my clothes, and she’s got a corporate credit card. Hayes: Why be the fox guarding the hen house, when I can be the wolf who mauls the fox and anyone else who gets in her way? Wyatt: It might be the ’30s, but Jersey is Jersey. Commander Rosendahl: Who are you? Lucy: This is Dr. Dre. I’m Nurse Jackie. We’re from General Hospital. Jess: Let’s get ready to Rodham! Director Mace: There’s so much S.H.I.E.L.D. history that Agent Carter herself didn’t know it all. Mack: Why? Why are you doing this? Fitz: Because she’s turned her back on us, Mack! Because something terrible happened, and she didn’t want our help getting through it! Fitz: Well, we’ve all been through terrible things, all of us, and we’ve never turned our back! Daisy: I…I’m doing what I need to do. Mack: And it still affects us. Like it or not. Kevin: What did I ever do those first two minutes without you? Kate: Uh, you cried and you crapped a lot. Toby: I heard that Deadpool was her idea… or maybe it was Hamilton, I get those two confused. Rebecca: Hey, how do you think we’re doing so far? At parenting? Rebecca: ‘Cause I think we’re at a six. On a sliding scale, one through ten, I think we’re at a six, and I think I’m being generous. Rebecca: Seven, fine, but only because there are three of them. Jack: Bec, what are you saying? Rebecca: The drinking has to stop. You have to reign it in, baby, because I won’t have it in my house. Jack: You won’t have it in your house. Rebecca: I won’t! So, if it’s a problem, fix it. Be a man, and fix it. Because I’m done letting you lower our score. Ron: It wasn’t your fault. It wasn’t Gina’s fault. It wasn’t Charlie’s fault. It wasn’t anybody’s fault, Toby. It was an act of madmen. You think a tent was going to stop them? We got the President in the car. We got Zoe in the car. And at 150 yards and five stories up, the shooters were down 9.2 seconds after the first shot was fired. I would never let you not let me protect the President. You tell us you don’t like something, we figure out something else. It was an act of madmen.